Thundering hooves pound the grasslands. Over the rise the herd appears, horses with manes flowing in the wind of their own passage. Their varied colors of chestnut and sorrel, palomino and pinto mirror the reds, tans and golds of the canyons and mesas that edge the Plains. Say “wild horses” and this is the image that springs to mind, mustangs roaming the deserts and prairies, an echo of the Old West. Coastal salt marshes and maritime forests are not where you would expect to find these wild creatures. Yet the southeastern coast is dotted with small herds of ponies. 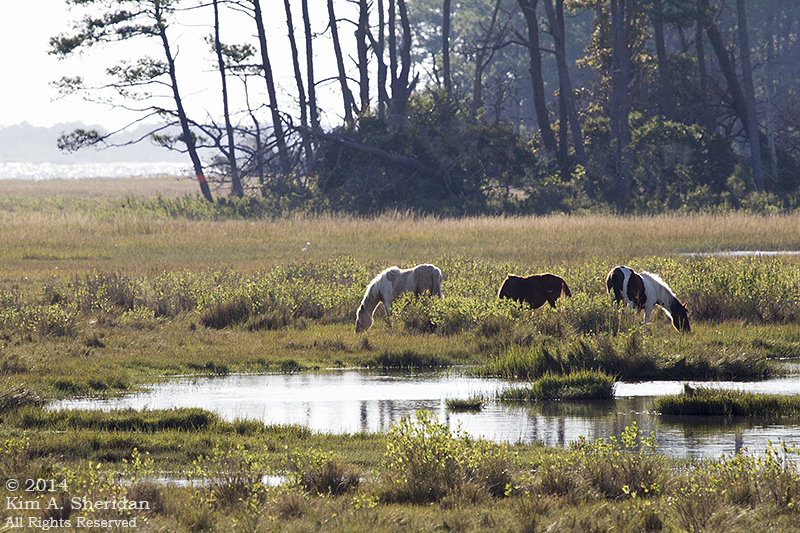 One of the most famous of these herds lives in the Chincoteague National Wildlife Refuge, which is part of Assateague Island National Seashore in Virginia and Maryland. 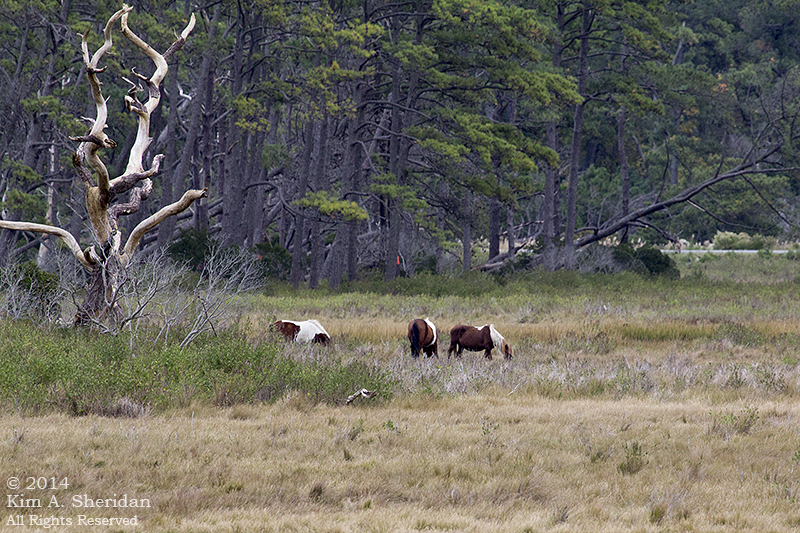 Local legend says that the Assateague ponies are descendents of horses that struggled ashore from a shipwreck. More likely they are the offspring of tax-evaders! Farmers in the 17th century would turn their animals loose on the island to avoid the taxes levied on free-roaming mainland livestock. 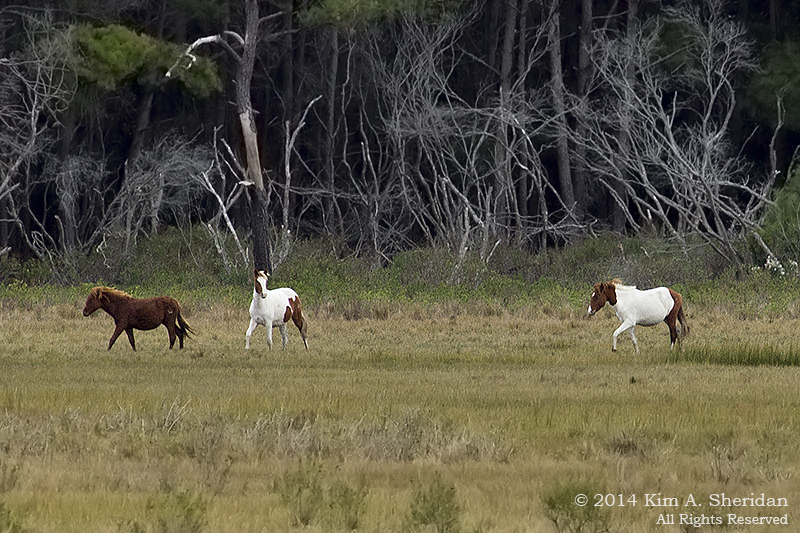 Today there are two herds on Assateague Island. The northern Maryland herd is owned by the National Park Service, and roams free in the Assateague Island National Seashore. 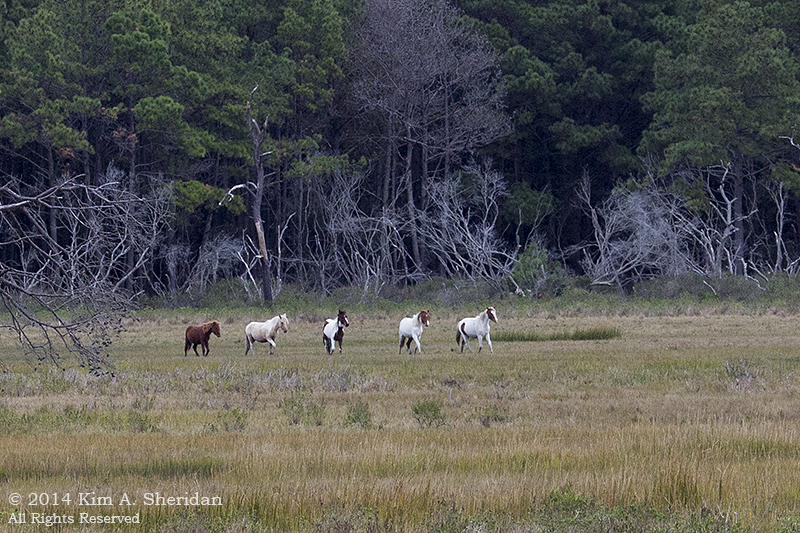 The southern Virginia herd is privately owned by the Chincoteague Volunteer Fire Department. Once a year, on “Pony Penning Days”, they are driven across the channel to Chincoteague Island. Many of the young foals are auctioned off before the herd is swum back to Assateague. This helps keep the horse population at a healthy level, and proceeds benefit the fire company. 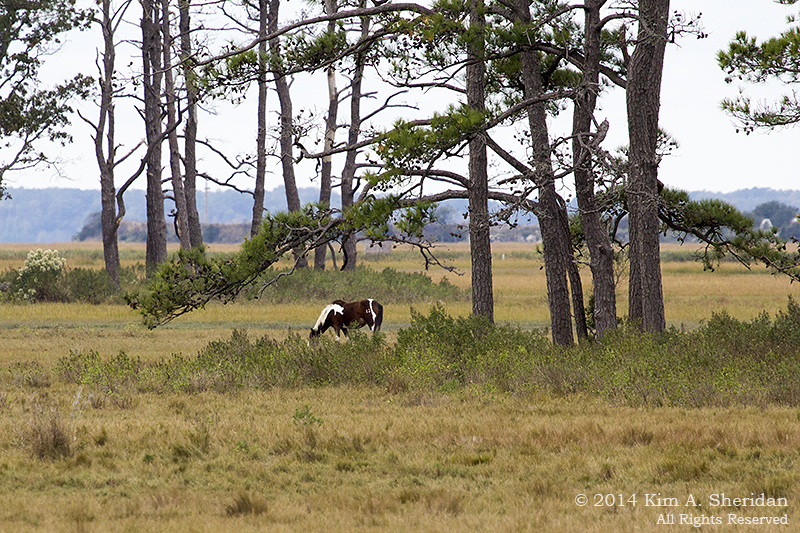 Lone horse under a loblolly pine, the predominate tree of the maritime forest here. The wild horses live rough, no cushy stables for them. Cold stormy winters find them in the shrub thickets and woods. The moderate months of spring and fall are spent in the marshes. In summer, heat, humidity and hordes of biting insects drive them to the beach and into the water. Dead trees and shrubs are everywhere, fascinating in their naked beauty. The salt marsh is a harsh mistress. For the ponies, too. Most of my photos were of headless horses, their faces buried in the grass. They graze constantly. I thought their rotund appearance meant the ponies ate well. In fact, it’s just the opposite. Their diet of salt marsh cord grass and salt hay is abundant but poor in nutritional value. It’s also salty, which leads the horses to drink twice the amount of water a domestic horses would drink. Those round tummies are the result of water bloat. Like many children, I grew up on Marguerite Henry’s 1947 book Misty of Chincoteague, about Pony Penning Days. 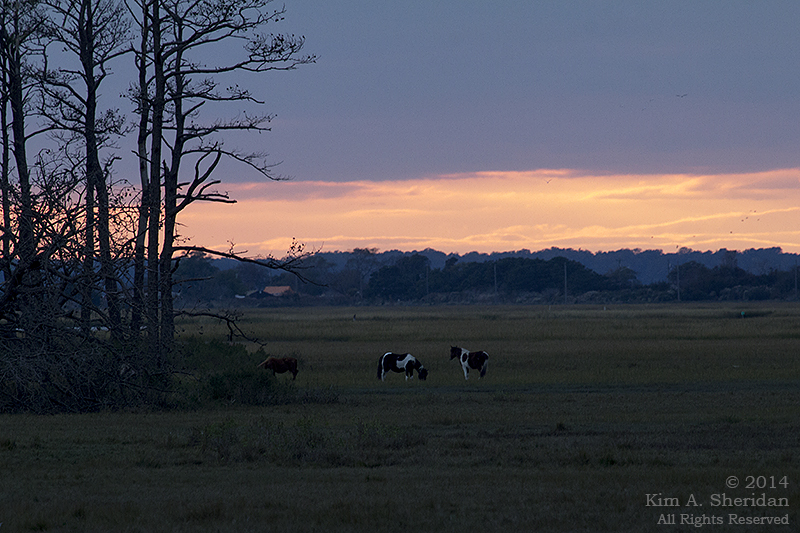 Little did I dream I’d someday get to see those wild ponies, grazing peacefully at sunset. 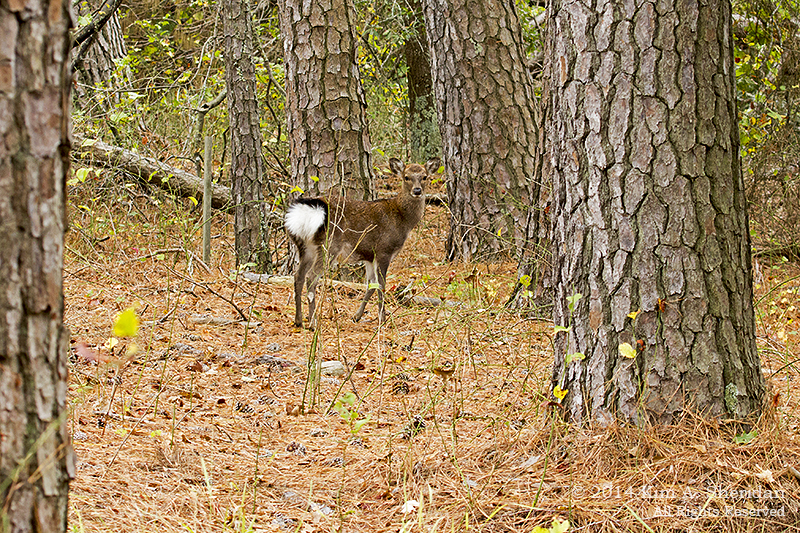 There’s another critter with hooves at Chincoteague NWR that’s equally captivating. This is a Sika Elk. They look like a smaller version of the native White-tailed Deer. But they are a non-native species introduced from Asia by an Eastern Shore man named Clemment Henry in the early 1900s. He released a half dozen elk onto James Island in Chesapeake Bay, and from there the population grew and spread. We encountered several Sika Elk on a walk through the woods. 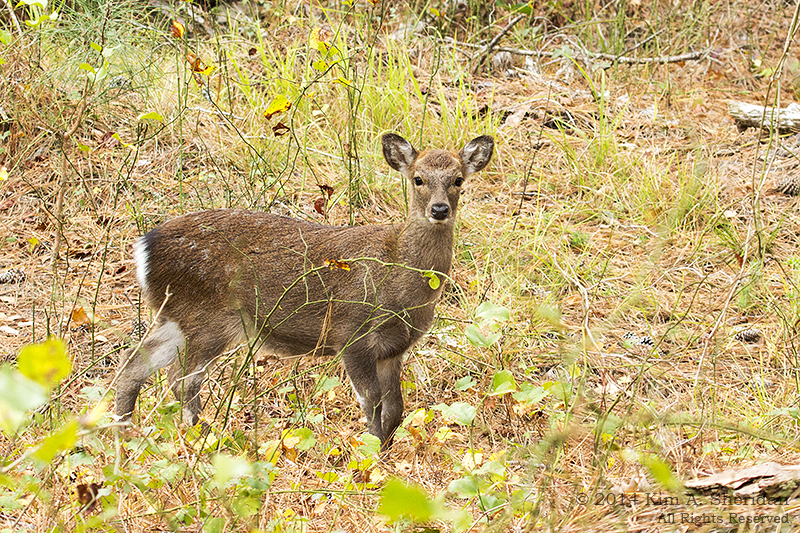 They regarded us with much curiosity, coming closer to us to get a good look when we stood quietly. See the spots on the white rump? They remain throughout adulthood, unlike the native White-tails. This elk demonstrated an unusual way of bounding away that I can only describe, poorly, as a stiff-legged bounce. Watching it hop had us in stitches. 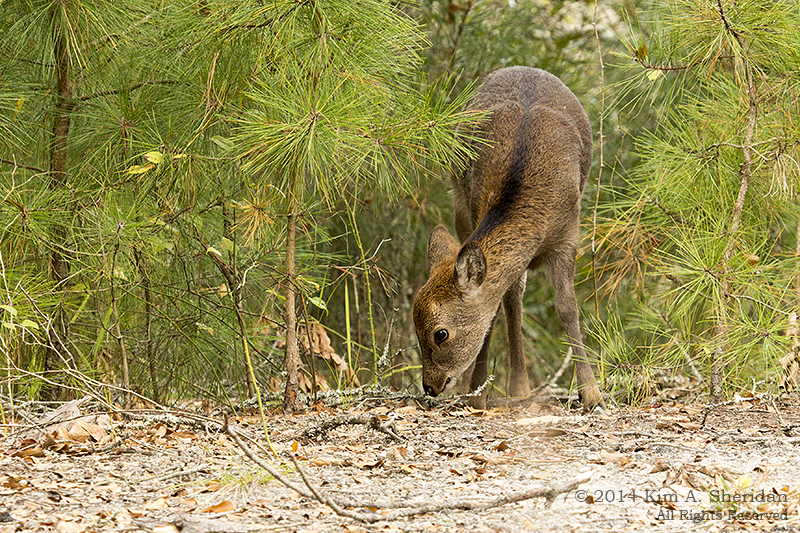 Yes, like the wild horses of Assateague Island, these little Sika Elk are quite “endeering”!